See how often and when your periods align with the lunar phases (e.g. full moon, new moon). Chart for all tracked periods, or by cycle range. To chart all tracked periods, leave from and to fields blank. Member? Login to use the period moon chart. After login, the first day of each period you've tracked will fill in above. Not a member? 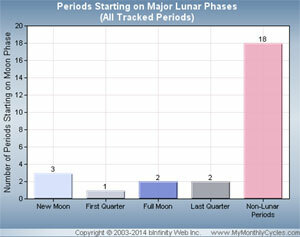 Join now to use this lunar cycle period chart and many more free period calculators and cycle trackers! Chart non-lunar periods - Specify Yes to chart periods that do not start on a major moon phase, In the sample chart above, the bar at far right shows a count of all non-lunar periods. Select No to only chart periods coinciding with lunar cycle phases. Sort Report By Period Date - A report will be displayed below the lunar chart with a list of your periods aligned to moon phases. Specify Yes to sort report by period date, or No to sort by lunar phase. FYI: Want to see the lunar phases on your MyMonthlyCycles Cycle Calendar? Update your Preferences, setting Show Lunar Phases to Yes! Copyright © 2003-2019, bInfinity Web, Inc. All rights reserved.